The wood arrived unscathed and neatly bundled on a linear pallet, its mysterious past ingrained in its gorgeous multi toned surface. It was 50 square feet of fragrant, reclaimed and newly [re]milled walnut. I playfully fabricated unique back stories about the history of this salvaged wood but the truth is, we don’t know. I briefly considered inquiring as to where this walnut was found, and what purpose it previously served, but quickly decided to embrace the unknown. This material was reserved for a very special moment in our project, that of entry. 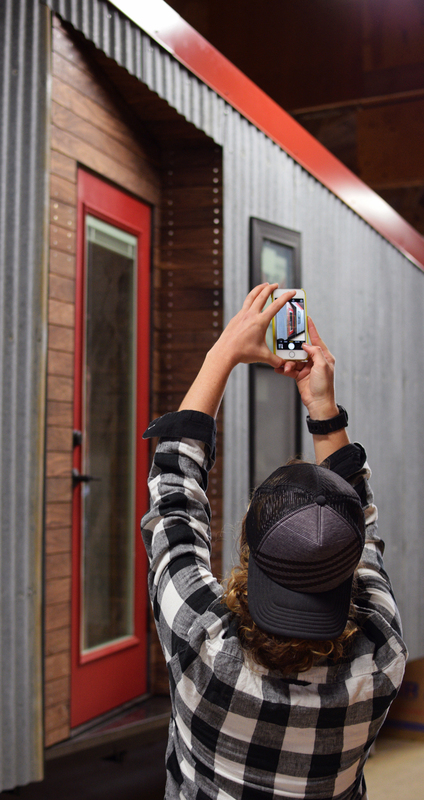 Interaction with its application would occur daily in our comings and goings and we had very specific vision for this moment: ½ inch flush face shiplap reveal siding with exposed stainless steel flathead, square drive hardware, installed as a rain screen system. I had admired this type of aesthetic in architecture magazines many times before and had always wanted to incorporate it into a project. The dark walnut would complement our dark window frames and stand in stark contrast with the rest of our dull grey corrugated metal siding that was salvaged from a local barn roof. SHED has officially been sided with 100% reclaimed material. The wood, having already undergone a lengthily milling process, was far from the end of its journey and we staged the project site to optimize the tasks. We first sorted the wood into similar tones, valuing the darkest tones and most unique grain patterns for the entry alcove siding and setting aside the rest for some small interior applications we have in mind. I would take measurements from the siding location and cut the boards to length, 2/3’s of them needing a 45 degree mitered cut for the corner condition. I would pass the cut pieces to Samantha who had a small table top drill press rigged up with jigs to allow her to precisely drill and counter sink at least 4 holes into each board. Samantha would then coat each piece with Seafin Teak Oil which is a rub on marine grade product that leaves a very natural finish (not glossy) and does not discolor or peel off with time (although re-application will be required). A quick wet sand with 400 grit sand paper before the product soaks in and dries leaves the wood with a protected, smooth and natural appearance. Installation was a slow and careful process of using an 1/8 spacer to keep a consistent reveal between pieces while installing nearly 400 screws into the pre-countersunk holes. On these late evenings we turned raw material into a finished product, and a vision into a reality under the observation of the resident owls silently perched above. We worked late into the nights until the aggressive chatter of approaching coyotes chased us off for the evening. The process was messy and beautiful all at once, full of small imperfections and unblemished memories that have become the ultimate reward of this project; an experiential gift that that will keep on giving, keep on inspiring and keep on empowering us. “Look at what we’ve accomplished so far!” I silently scream to myself each time I return to our project site to start another days work. The adventure that this has become is truly taking shape, and I don’t ever want it to end. Your idea to clad the front door with recycled wood really worked well! Looks wonderful. You guys have to be so proud of your work, and work done really well.